Before and After carpet cleaning and this is only the first pass! 250 SQ FT Carpet Cleaning for Only $127 + New Client Special Adds an Extra 100 SQ. FT FREE = Total 350 SQ FT for Only $127. Includes preconditioning prespray with heavy duty traffic lane cleaner, followed by truck mounted steam cleaning. Also includes normal amounts of spot removers. (Additional Sq. Ft. at 47¢ /sq. ft.) (Very heavy soiling is 55¢ /sq ft. ***extremely rare. Stairs count by the step.) Includes “Most Thorough Guarantee”–see below. Bonus: Have 5 or More Areas Cleaned (700 sq. ft. minimum) and Receive an Additional 50 SQ FT Cleaned Free and Save an Extra $23.50, for a total savings of $70.50. Read on for many of the reasons why our carpet cleaning quality stands so far above that of any other company. Peruse our dozens of raving 5-star reviews on this site. If that’s not enough for you, we’ll direct you to the scores more on Angie’s List, Yelp, and other referral services. Then there are hundreds of testimonials we have received off-line in both our new and old company names (some people mistook our old name for a maid service, which we don’t do, so we change it–lol). Also, take a look at the carpet cleaning case studies, where you’ll see how we solve big problems real people have just like yours. You must wonder why other carpet cleaning companies serve 80% one-time-only customers, while our clients, who’ve all experienced other companies, stick with us decade after decade. Why do we get thousands of referrals from clients, realtors, interior decorators and other professionals? We have a well-earned reputation (since 1983) of doing a fantastic job, particularly in the field of carpet cleaning. The fact is, after cleaning hundreds of thousands of carpets, some of them thirty years old or older, we have needed to honor that guarantee a handful of times. Meanwhile, in our struggle not to be satisfied with doing just a “good” job, but in striving for perfection, we have become a far better carpet cleaning company. Long ago we made a running list of what our clients wanted out of a fantastic carpet cleaner and we figured out ways to deliver more. Among other things, we try to honor your time and keep in communication with you. Let’s not spoil the surprise by bragging about the extras we do, let’s see if you notice a few. There are dozens built into our service systems for the average carpet cleaning, where we go above and beyond what any other carpet cleaner would do for you. There are trade schools for our industry with numerous classes and degrees called “certifications.” Chris and Wendy are both “Master Cleaners” for decades and are required to take a certain number of classes per year in order to maintain their status. 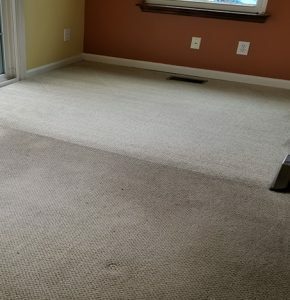 All our carpet and upholstery cleaning technicians hold certifications in those areas as well as many other useful areas such as advanced spot and stain removal techniques. We have a strong belief in ongoing education because the chemistry of cleaning as well as the chemistry of fibers, and fashions of textiles are always changing and all those contribute to changes in the best ways and methods of carpet cleaning. Well educated technicians mean no damages for you and cleaner textiles. The sad fact is, most carpet cleaners from the average company, don’t know these schools exist, let alone have the willingness to pay the steep cost of tuition and attendance. With 36+ years of experience, you’d think we learned something. We don’t just send our techs to school, we intensely train them on the job ourselves as well and pass all that working knowledge on to them. We invest in the best equipment and specialized wands that can achieve superior results. For example, while most carpet cleaning companies just use their floor wand to clean stairs, leaving them poorly cleaned and over-wet in places, we stock a very expensive stair tool with a swivel head allowing us a full range of motion on the step, unlike any other carpet cleaning company. Further, we triple detail the steps, cleaning the nose with a separate tool called a bullnose wand which cleans and dries the nose of the steps excellently. Thirdly, we hand detail around the edges and crotch of the steps. As a result, the stairs come out far cleaner, fluffier and drier than other carpet cleaners can ever hope to get them. We also stock a variety of other wands that cost thousands of dollars designed for specific applications like extreme soiling, pet urine/stains, etc. Likewise, while other companies are using the cheapest cleaning agents (because they mistakenly think all cleaning agents are the same), we’ve gone through the time and effort to do scores of side by side comparisons on multiple carpets with each cleaning solution from each company (there are over a hundred). We are using the very best we can find, to give you the absolute best carpet cleaning. Our solution of choice is natural, organic and outperforms compared to the chemical detergents we once used, and the industry still relies upon. They leave almost no residue compared to most others. We also have organic and no-residue options available with slightly lower cleaning power. All options are hypo-allergenic and biodegradable. Have you ever done a paint by numbers painting? If you followed the instructions, it came out just right every time. We have a formula we follow in each room of each home or business that makes certain everything gets perfectly clean–around the toilet, behind every door, around the register, under the drapes, every nook, corner, and cranny. Every traffic lane, spot, stain, and high use area as well as the filtration soiling along the edges of steps and walls (which is not always completely removable). One tech can even set down the cleaning tool right where he is working and walk off the job as another walks on and without saying a word to each other the new tech can pick up right where the old tech finished off without missing a stroke. We follow the format so that nothing ever gets missed or forgotten. We always get under the overhang of the counter. We always get under the furniture you want to be moved. We always put protective blocks and tabs under it. We always wear shoe covers and white gloves and provide extra shoe covers for you if you like. That and much more–it’s all part of a big system of habitual service. We don’t cut corners–we clean them. Whether you only need a few rooms of carpet cleaning, your whole house, or either a one-time carpet cleaning or a maintenance program for a 12-million square foot office complex, SPARKLE Surface Care is up to the job. We have the trained staff and equipment to handle it. We are poised to expand. As a valuable client, we respect you, your time and your property and we are committed to clear, efficient communication in order to fully satisfy or exceed your expectations. For your convenience, we offer flexible scheduling, free phone estimates or a written proposal (as needs demand), and a quick response to your call. Life happens. So does dirt, dust, germs, grime, and disequilibrium. By letting us keep your carpet, floors, and furnishings clean it fends off the stresses life brings and rewards you with the sense of balance, peace and inner sanctum you so much need, deserve, and can now reach. A clean healthy home is a restful, happy home! If you’re looking for “carpet cleaning near me” throughout southern New Jersey, Princeton, and the coastal areas, contact us online or call (609) 953-0472 today. We’re based out of Medford, but we serve lots of clients all over daily. We’re certain to be available in your area right now or within a few days.